Time to pack. We seem to have a ridiculous collection of souvenirs, probably need an extra bag at airport, and there’s still two weeks left. Disney delivered a receipt for the charges to the room during the night, so if it’s all correct we can skip check-out. It is. We start throwing things in bags bit it gets boring fast so we meet back up with a friend for breakfast at the main lobby. Afterwards we decide to go for a short walk to stretch the legs before the long car journey and it gives us an opportunity to explore the resort. 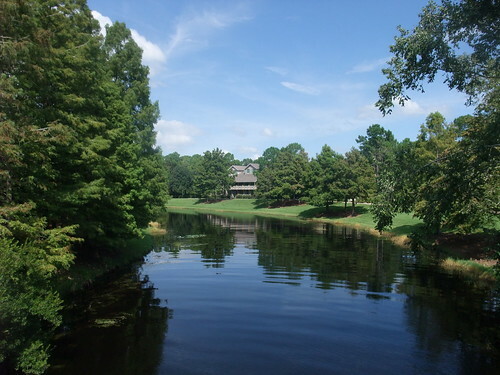 Port Orleans Riverside is a mid range priced place, but certainly one of the best. It has a lake with a large island at its centre which has a good sized pool with a fume and other nice touches. You can also go fishing. Just next to the lobby they have variously sized motorboats for hire and different bikes up to six seater. There’s track that winds between the rooms, which the east side somehow looking much posher than the west (same price though). 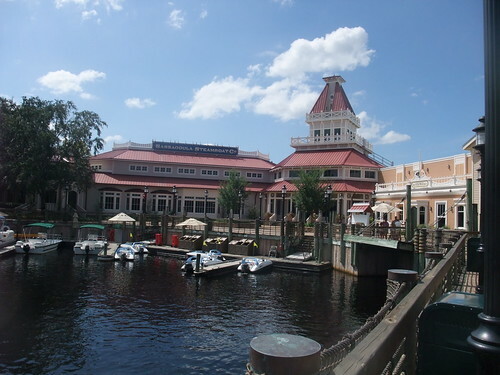 You can also take a regular boat trip to down town Disney or across to the sister resort Port Orleans French Quarter. Inside there’s a large games arcade, bar, restaurant and large buffet for all meals. There’s also the obligatory souvenir shop – which we stop buy for one last souvenir, you can never have to many you know… We buy some postcards and get them sent then it’s back to our room to finish off. We set sail later than we’d wanted heading north through Orlando towards our target Savannah. The roads are busy and we still haven’t got into the right side driving yet. A few horns beep as we discover the huge blind spots our car’s mirrors have. We stop to pick up some lunch but don’t want to eat at the road side so we decide to point the satnav at “Daytona Beach”. We drive along the major road through Daytona beach and get right up to the sea. A sign across the road proclaims “Daytona Beach: the worlds most famous beach”, probably true. We pay the $5 and drive right on to the beach, find a space between the other vehicles and park up just 20 feet from the shoreline. It’s a thin but long beach of bright white sands and stretches of in to the distant lost in the heat haze and mist far off. The waves look great for surfing though there’s only a few out there, most people are sunbathing. I think it’s time for a paddle. I stand in the Atlantic looking towards England, I can’t see my house from here. The tide moves towards us fast, approaching on the road, some of the sun worshippers are caught out as the sea rolls through their spots. Hilarious to watch, but I seem to be the only one laughing, must be a regular thing here. Too soon we have to leave and we drive towards the exit with the shore lapping at our wheels. Still three hours of driving to go, and we use some of the time doing a cryptic crossword – I impress myself and work one of them out – then try to decide what the best rides have been. We both agree Universal’s Harry Potter ride was one of the best. I’d also recommend Expedition Everest at Animal Kingdom, Simpsons ride at Universal Studios. Space Mountain at Magic Kingdom and Indiana Jones show at Disney Hollywood. We arrive fairly late in Savannah and decide to relax in the hotel for the evening. The rooms are nice, split into two several rooms and has two flat screens. Bed large and comfortable. Would have been fine if, just before I climbed into bed and reach for the remote, a large beetle hadn’t scurried across my bedside table. sorry, i’m Bit out of order. No wi-fi at Disney. Crazy.